We love the story author Sally Roth tells about the butterfly that tried to sip nectar from a caterpillar. It wasn't just any caterpillar but one that looked like bird droppings. You may not know this (we certainly didn't), but some Butterflies like a little nectar from bird droppings now and then. Anyway, this one butterfly would land on the caterpillar and the caterpillar would shudder and then the butterfly would fly off. But, this was a stubborn butterfly and it continued to land on the 'bird dropping' caterpillar, even putting out its proboscis to test for nectar. After a while, the Butterfly gave up on that 'dropping' and tried the one next to it. The same scene ensued until finally the Butterfly gave up all together. You just never know what will happen in the garden. If you have never read one of Ms. Roth's books you are in for a real treat. Her writing style is wittily informative which makes us enjoy our lessons. She not only teaches us which plants to use in our gardens to attract both these winged wonders, but how to create the kinds of gardens they prefer. Shelter, water, host plants for butterfly caterpillars, and even fruit feeders and hibernating boxes are among the topics within these pages. Maybe the only problem with this book is that you will be so busy looking at all the colorful photos and how-to diagrams that you will keep losing your place among the words. 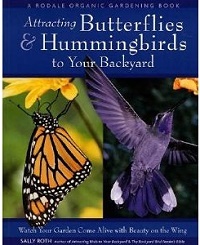 Attracting Butterflies and Hummingbirds to your Backyard is a worthwhile book for anyone looking to attract a little life into the garden.